In a workshop on special education, inclusion expert Dr. Cheryl Jorgensen simulates a class activity with a group of teachers. She asks them to pretend they’re students in a traditional social studies class, and among them is a hypothetical girl, Kelly, who has Down syndrome. Kelly is nonverbal and has a talking device. She can press buttons on a device, and those buttons speak her ideas. Her talking device is projected on the wall. Kelly’s vocabulary options are: Hello, Goodbye, Help, Bathroom, Yes, No, Break, Hungry, and Drink. Nine words. Three rows of three. Jorgensen pretends to play the teacher of this class. “Who was the 16th president of the United States?” Remember, she’s talking to teachers who are pretending to be students. She asks someone to play Kelly, and “Kelly” approaches the projected screen in order to touch her answer. “It wasn’t one of the choices,” says a participant in the workshop. “She’s too retarded to have those choices,” Jorgensen says curtly. Before you gasp, know that Jorgensen is not speaking her own opinion. She’s ventriloquizing the attitude of educators who operate on a dangerous assumption: they assume Kelly can’t. They assume Kelly can’t communicate with more than nine words, and they assume she can’t know who’s the 16th president of the U.S, and they assume she can’t learn the mainstream content with her typically developing peers. In her workshop, Jorgensen argues that the least dangerous assumption is opposite of this attitude. It’s the simple, powerful phrase: presume competence. Presume Kelly can achieve in a regular classroom. Presume she can learn what the rest of her peers can. Presume she can speak with more than nine words. If you spend a few years working with special educators and therapists, as we have, and then meet someone who greets your daughter with this presume competence attitude, you realize how radical and rare it is. A year and a half ago, I asked an early interventionist to help us with the significant gap in Fiona’s expressive and receptive communication. As you might know, Fiona is nonverbal. Her expressive communication is limited to pointing, eye contact, facial expressions, maybe twenty rough signs, and a thousand ways to intone her only sounds: mm, um, and hum. But she understands a thousand times more. So I asked her early interventionist to help me create a picture system for Fiona, one where she could point to pictures to express her wants and needs. The therapist was initially enthusiastic, but eventually thought Fiona wasn’t a good candidate. She thought Fiona would “stim” on the picture cards (at the time, Fiona loved to hold cards and tap them against the palm of her hand.) The therapist encouraged a few signs, but didn’t provide much else in the way of augmentative and adaptive communication. Nine months went by. Meanwhile, Fiona just kept learning more and more vocabulary, without the ability to express it herself. Someone alerted me to a special service in the state. I tooted a horn, or sounded a bell, or spoke whatever magic words unlocked the door to this service, and it led to intermittent visits from an Augmentative Communication Consultant. Immediately upon meeting her in our living room, I saw her “presume competence” attitude, an attitude that was as front-and-center as the very shirt she wore. “Does she have an alphabet app?” she asked Fiona’s early interventionist, who was also at the meeting. “The alphabet?” the therapist said, like it was a foreign word. Like the subject of the alphabet was as incredible and out-there as astrophysics. Fiona hasn’t shown the ability to steadily hold a crayon yet. But that didn’t matter to the communication expert. This woman thought Fiona should have access to the alphabet in any way that we could give it to her. And why not try some apps on an iPad? Over the course of a year, this expert watched Fiona carefully, assessed the gap between her expressive and receptive communication, observed her fine motor limitations, and eventually made a recommendation. The problem? With motor planning comes fixed targets. The size of the targets in Speak For Yourself cannot be changed, and the mainframe offers 120 words. 120 words on one iPad screen make for some pretty tiny blocks. Fiona is not yet isolating a finger, so she hits the screen with two or more fingers, and often rakes her hand across it, hitting multiple targets. Once in a blue moon, she hits her intended target, but more often than not, she doesn’t. I wrote the communication expert. I told her my concerns. I photographed pictures of Fiona touching the screen. I underscored Fiona’s fine motor limitations. I underscored the opinions of Fiona’s therapists, all of whom had met the app with serious skepticism. “Woah,” her occupational therapist said when she saw all those tiny boxes of words. “The buttons are even small for me,” her physical therapist said when she tried to integrate the app into therapy. The communication expert scheduled another meeting. When she returned to our living room, again with that “Presume Competence” attitude front and center, she listened to my concerns. She nodded. And then she said things that made my heart sing. She said: We cannot allow Fiona’s fine motor impairments to limit Fiona’s language development. She said: We cannot only give her the number of targets she can accurately hit when she knows hundreds of words more than that. She said: We give her the language. And then we help facilitate her use of the device until her fine motor skills catch up to her language abilities. She said: We give her the language. Friends, the sentence almost makes me cry—the kind of crying you do when you realize a weight has been sitting on your chest, and someone has just plucked it off you and said, “Here, let me take that for you. You don’t need that.” So much lightness. So much levity. We give her the language. Fiona is touching her Speak For Yourself app, about 100 words displayed for her reach. The picture feels like a radical gesture in presuming competence. Let me be clear. Fiona cannot yet use this app to express herself in any way that you or I would. In this photo, she is exploring. She is hitting the screen and observing what happens. But she is very interested in observing what happens. And when she hits a word she knows and likes (water table, Grammy, mustard, Sesame Street) she lights up, looks at me, and grins. Then she resumes her exploration, striking “up” or “shake” or “doctor” or “heavy,” or striking no word at all. We have many strategies at our hands. We are giving this a full year. The theory is this: if it takes a typically developing child approximately one year to speak his or her first word, then it can take a child like Fiona just as long to eventually use the communication app expressively. We won’t expect her to touch a word in an intentional way any time soon. We won’t pressure her. We won’t use the app as a way to “test” her fine motor skills or her vocabulary knowledge (“Where’s the cow, Fiona? Point to the cow.”) That’s not communication. That’s a dog-and-pony show. Instead, we’ll model what the app can do. We’ll comment on the weather with it. We’ll offer her choices with it, and she’ll nod yes or no. We’ll review the day’s adventures with it. And we’ll let her explore it. I think half of her therapists believe we’re a little delusional, and I don’t care. We are presuming competence. We are paving the way for a shared language. We are believing in our girl. Yes, it is a chasm of a difference, presuming competence. So rare and beautiful to see in action. Keep looking for and working with those folks, right? Excellent post. They can think anything they want, those naysayers. The truth is that Fiona’s intellect needs a way out of her mind, and you’re giving her the tools to accomplish that exit-of-language. It’s so much easier to be a coward than to dream. Thank you, I needed to read this. I bought SFY for our ipad mini a few months ago, along with a keyguard, and my son (who is not yet isolating a pointing finger either) and I played with it on and off. Then, for some reason, I let it get tossed to the side, I put it away. We didn’t have any immediate successes, our therapists had a similar shocked/you’re crazy reaction when I showed it to them, and it didn’t seem… like it was happening. But I DO presume competence, and I know he has thoughts he could share – I wish we had an amazing AAC lady to help us but… I love the sentiment “give him the language” – we need to persevere! What is the case you’ve got for Fiona? I wonder if the diff between a mini and normal sized ipad would make a difference when fine motor is such an issue. Also, is there an alphabet/writing app you’re using as well? I LOVE this post!! Alongside the attitudinal issues which are huge, we also often talk in the office about exactly how these same assumptions are even built into many of the AAC systems provided to children. As adults we’re all relatively familiar with -if not exactly comfortable with- the concept of opening virtual folders with the things we want inside them. Yet for a child unfamiliar with what is a pretty abstract concept that relies a lot on memory it’s a terribly inefficient model around which to design a system for communication. Ever looked for a hard to find file on your Mac/PC? Let’s hide all the words they need to express themselves, then when they can’t find them and become frustrated or fixate on the handful they can find we can assume they just aren’t ready for AAC or are very limited in their abilities?! Things really need to change. Love your presume competence blog post! Benik makes a finger isolation hand splint (soft neoprene, get the optional Velcro openings). It has worked nicely for several children. The nice thing is, after they have been successful with it, they don’t need it much longer. They figured out how to be successful and they learned how to do it themselves. Gayle (no, I don’t work for Benik). i totally agree with you. When my daughter was 3 years old we were told she had severe cognitive difficulties and would never be able to attend a mainstream school. Excellent! Our story is similar except we didn’t find SFY till my daughter was 21 and about to age out of school. Jessie’s fine motor was poor and we too were advised against the iPad. We are nearing the 18 month mark. This App is life changing!!! Excited to read this post!! Great article. 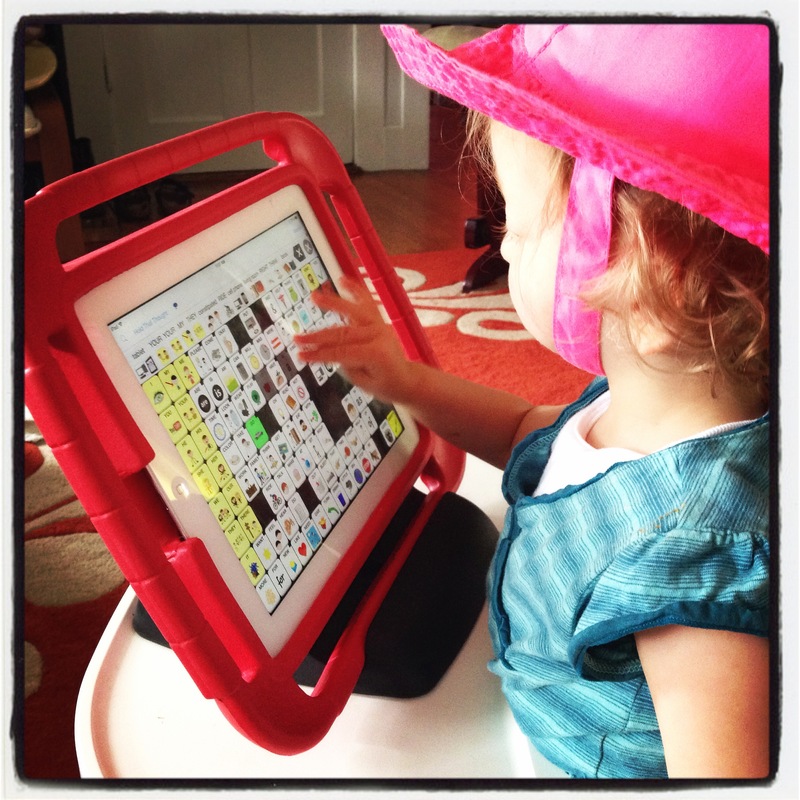 Did your OT or AAC consultant suggest any way for Fiona to improve her index finger skills. There’s a lot of drag and drop apps, such as Flow Free, First Words, Amazing Shape Puzzles, Sentence Maker and BitsBoard Pro which you can help Fiona do by just using her index finger. And of course she can make pots for everyone with the Pottery app! Enjoy! I know this will be unpopular, but I have a real, genuine concern about the over application of presumed competence. I do believe it can and does cause harm in certain situations. Severe and profound intellectual disabilities do exist. Babies are born who have suffered prolonged oxygen deprivation. Babies are born with chromosomal anomalies that cause global developmental delays. Children suffer brain injuries. These children are real, and have real needs of their education team. They may never discuss the president with their teachers, but being able to ask for the bathroom, to go outside, or to have something to eat can be life altering and profoundly helpful for their quality of life. What about these kids? Should they have an AAC device they do not understand and cannot use that has all the names of the US presidents, and words for emotions that are meaningless to them? There is an important element of individualization that gets brushed aside here. These children exist, and require their own unique services that do not presume they are just like everyone else. No one really knows what another is processing. There is no universal one size fits all answer. We have to remember that there is a spectrum within each diagnosis. We also need to treat each person with the same respect whether they are able to communicate or not. Someone is not “less” because they can’t speak, however, our society quickly defines and dismisses people if they aren’t validated with a proper response. Our daughter is basically non-verbal, however, throughout the years she has said phrases and multi-sylllable words clearly and appropriately. She had proven to us comprehension, we just couldn’t find the appropriate AAC. Try telling this to any other person and they look at you like you are delusional. Not that long ago, my husband and I were arguing/discussing a grammatical issue. He did not like the way I was using a specific word. Our daughter, through SFY, then said “conjunction”? She was correct. The is noteworthy because we have never taught her the rules of grammar and this word had not been programmed into her iPad. She had found it during her hours of exploring the babble feature. She had remembered where the word was and used it quickly. We all process information differently. Some faster than others. Add fine motor impairment coupled with a vision issue and it seems not likely that someone could possibly excel using AAC. Sometimes we just have to wait long and work harder. This is the path we have been on. I believe we are in uncharted territory now that there are AAC options that allow people to communicate. In time, I believe that there will be less people defined in such a limiting way because technology has finally opened a door that had been closed. Fiona is blessed to have parents that ask questions and have patience. The biggest shame would be if they didn’t even try. This is true but I think Heathers post highlights the fact that every child is different, with their own particular needs and abilities, and it’s on us all to be open to possibilities, and seek out good tools and the right kind of support to find out what each child’s individual abilities actually are, rather than the current trend of labeling children into broad categories where the assumption is most often about what they can’t do, which in my experience kind of puts an artificial ceiling on expectations. Well said! I encourage anyone with questions on this to attend the 2016 Rethinking Autism Conference. Come and hear the latest in autism research and understand that much of what we once believed was misguided and wrong. Far too many students are going through school without an education because of those ceilings placed based on bad information and dangerous assumptions. Meet individuals and hear how their lives have changed since those around them learned to #rethinkautism and presume competence. Visit autism.optimalrhythms.org for more information! Which does more harm? For a child to use words they don’t understand, and get an interesting response from adults? Or for a child to understand a word but not be able to say it because it’s not in their device? Obviously, in some situations, it’s very important to ensure understanding – such as when making medical decisions. But what harm can it do for a child to say the name of a president by accident when they don’t know what it means? At the very least, they could get an adult to talk and do some AAC modelling in response. Also, AAC can teach language. If every time you press the ‘stop’ button, the adult interacting with you stops what he or she is doing, that could help you figure out the connection. Even a kid working on basic cause and effect could learn that pressing a button on the device makes the device make noise and their communication partner react. So exciting Heather! Especially for you to watch not only as a mother but as a lover of words and expression and communication…this had to just make your heart sing. Go Fiona! This is a wonderful post and I applaud and encourage those of you who are recognizing how the presumption of competence is by far the “least dangerous assumption”. I’m in the process of starting a private day school that is committed to doing just this! Our ACCESS Academy (Assuming Competence Can Ensure Student Success) is the only school of its kind in the midwest and is modeled after the ACT School (Assuming Competence Today) in Phoenix, AZ. By providing specialized sensory and communication supports and access to general education curriculum, we have found that students often characterized as “severe and profound” have so much to teach us! There are far too many dangerous myths informing the treatment and educational norms in special education and early intervention. I encourage you to visit our website: http://www.optimalrhythms.org or our facebook page: http://www.facebook.com/optimalrhythms to learn more about the innovative work we are doing and the overwhelming success our students are experiencing. We are exploring convincing research related to the movement differences of autism and believe that severe autism is a movement disorder more so than a cognitive disorder. Yes, we often get those “you’ve lost your mind” and “how can this be so?” looks from “experts” in the field, but the evidence is overwhelming and difference our assumption makes in these lives of our families is priceless. Thank you for sharing Fiona’s story!